Home is where the heart is, and after almost 3 years at my London home, it feels like everything is finally in place and it really does feel like home. When we moved, everything was on a budget. Antique shops were searched, and old furniture was up-cycled. Now, I have been able to focus my time on the smaller, pretty details. I’d like to do a few interior posts, starting with the living room, and at the heart of this family room are two pieces of furniture ; the sofa and the coffee table. The latter is often one of the first things we buy when moving home – it’s a necessity so often something which we pick up as cheaply as possible. It’s then used as the home for the remote controls, drinks coasters and perhaps a magazine or two. Whether your coffee table is an antique beauty, an Ikea masterpiece or a DIY project – it is worthwhile spending some time choosing how you decorate the focal point of your room. So while I am not an interior expert, there are a few tips which I have to share for making the most of the space. 1.) Of course it has to be – flowers. Especially in smaller spaces for us city dwellers, flowers instantly bring a bit of the outdoors into our homes. Neutral elements add colour, and they don’t have to be pricey. My roses are actually fake – from The Chelsea Gardener, and at £12 for the bunch they are much cheaper than buying a new bunch each week! Although I do like to splurge on the real deal every now and then! 2.) Candles add a little ambience, whether lit or not – there are so many pretty options available, to suit every budget. 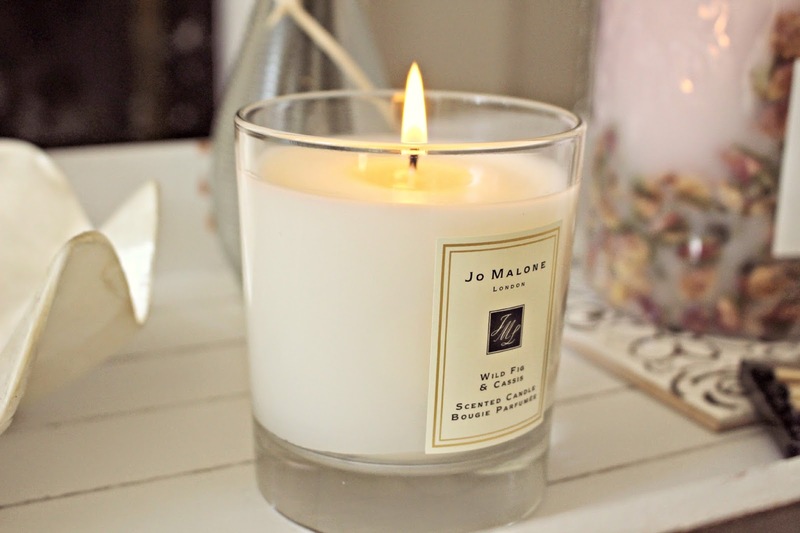 If you splurge on a luxury candle, the scent will add fragrance to the room, even when unlit. 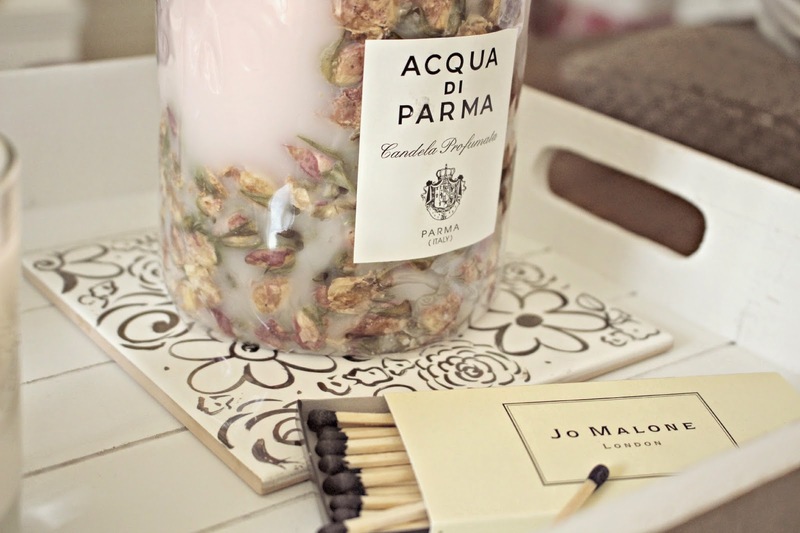 My absolute favourite is this Acqua Di Parma Fruits & Flowers Rose Buds candle (below) – its quite a splurge at £75 (from Selfridges, here) but everybody comments on it, and the smell is absolutely heavenly. I’ve only lit it a few times and the room always smells lightly of roses – which makes up for the fake flowers! The candle will last for up to 60 hours, and somehow Acqua Di Parma promise that the inside burns while leaving the outside intact. 3.) Books can be used as a decoration, but also to entertain visitors. On my coffee table I have a selection of picture books – such as the VOGUE The Editor’s Eye hardback (£18.00, Amazon) and the Mulberry 40th Anniversary Book – and a light reading interiors book by my favourite blogger, Emily Schulman (£10, Amazon). 4.) Personal Trinkets and decorative accents add personality to a coffee table. I usually have a candle snuff on the tray along with some matches, as well as a large pearl shell which we picked up on our last holiday to the Maldives. The tile which the Acqua Di Parma candle sits on is also a memorable trinket as it was hand painted by a local artist in my hometown of Gloucestershire (Mary Rose Young, check out her beautiful creations here). 5.) Finally, to hold all of the above, a pretty tray. 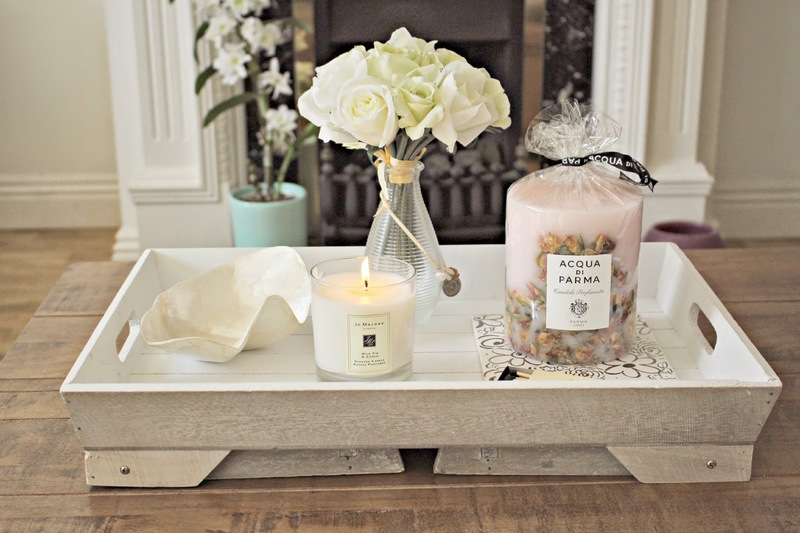 You might recognise this white-wash wooden tray from a lot of my beauty posts. The eBay find is so useful, and keeps my coffee table looking orderly by holding all the decorative accents. Decorating a coffee table shouldn’t be a chore or something you do in one day, instead, build up a collection of personal items over time. It will constantly change and items will be moved and swapped. If you are in need of some inspiration, there are hundreds of beautiful coffee tables on Pinterest! 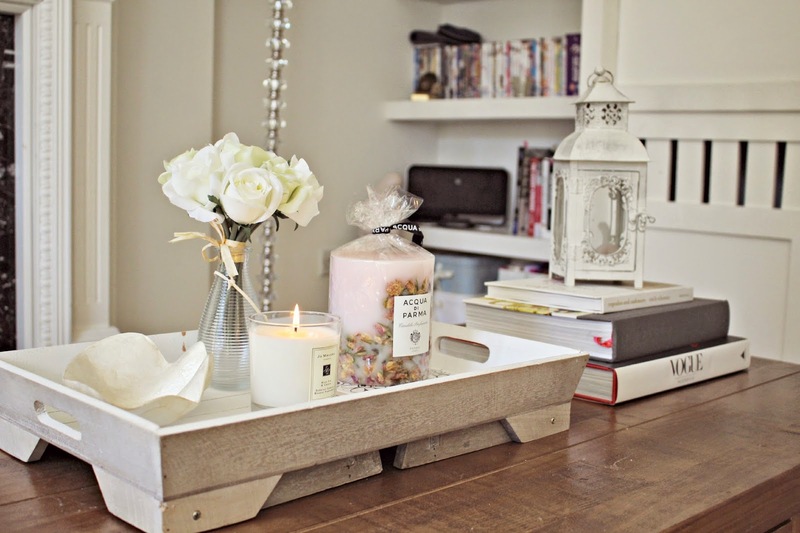 How do you style your coffee table? Do you like the interior post, and if so, would you like to see more?